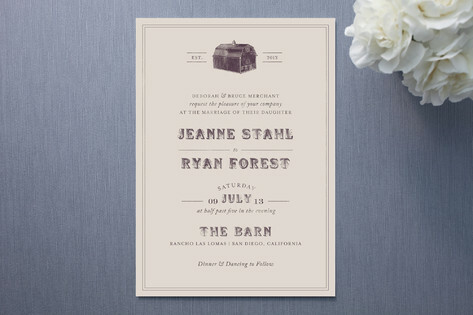 The Barn wedding invites from Minted are a fantastic choice for your farmhouse fete. These wedding invitations have a pleasingly distressed feel, as though they were printed by hand on the ol' farm. Just the thing for outdoor barnhouse and country weddings. Available in the following colors : Eggplant (shown), Chocolate Brown, and Denim.